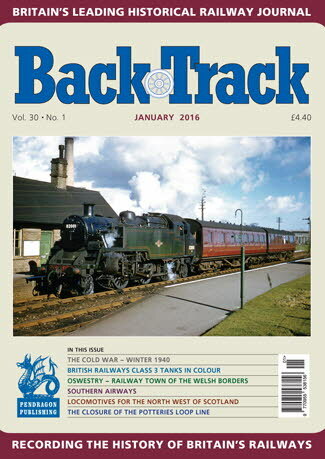 Railway Magazine | BackTrack January 2016 journal from Pendragon Publishing. As it was at Manchester Victoria - Tom Heavyside's colour of the station in the 1980s/90s before recent reconstruction. The Cold War: Part One - Malcolm Timperley describes the trials and tribulations of the railways during the bitter winter of early 1940. Locomotives for the North West of Scotland - Following his recent articles on railway development in NW Scotland, Peter Tatlow considers the locomotives specifically designed for these lines. Oswestry: Railway Town of the Welsh Borders: Part One - Jeffrey Wells describes how this once significant railway centre came about. At Paddington - archive photos of the famous GWR terminus. Spaced Out - Philip Atkins looks at some locomotive wheelbase oddities. The BR Class 3 Tanks - five pages of colour featuring the '82XXX' 2-6-2Ts. To Blackpool in 1967 - two colour shots of the North and South stations. The Closure of the Potteries Loop Line - E. A. Gibbins examines the case against the Kidsgrove-Tunstall-Hanley route. A Wheeltapper's Lot - Tony Robinson describes the duties of a somewhat misunderstood railway worker. Bridging the Gaps - some fine railway viaducts photographed in colour by John Spencer Gilks. Southern Airways: Part One: Flying Machines and Aerodromes - R.A.S. Hennessey considers the links between the Southern Railway and the growing aviation industry. Farewell to Allhallows - David Idle photographed the last day of this Kent branch in December 1961. Tiverton Junction - three colour photos by Steve Burdett in 1980.